Remember, Meditating isn't about sitting in awkward positions. accessing an inner calm no matter what's going on around you. But first, you have to learn to tame your mind. Make time to meditate. Set aside enough time in your daily routine for meditating. The effects of meditation are most noticeable when you do it regularly and consistently rather than sporadically. Some people will find a five minute meditation worthwhile, for others, the benefits of longer meditation is well worth the time. Depending on what the meditation is for. (Ex: relaxation, spiritual reasons, stress, etc.) You can meditate at any time of day; some people like to start their day off with meditation, others like to end the day by clearing their mind, and some prefer to find refuge in meditation in the middle of a busy day. Generally, however, the easiest time to meditate is in the morning, before the day's events tire your body out and give your mind more to think about. Find or create a quiet, relaxing environment. It's especially important, when you're starting out, to avoid any obstacles to attention. Turn off any TV sets, phone(s) or other noisy appliances. If you play music, make sure it's calm, repetitive and gentle, so as not to break your concentration. Meditating outside can be conducive, as long as you don't sit near a busy roadway or another source of loud noise. Sit on level ground. You don't have to twist your limbs into the lotus position or adopt any unusual postures. The important thing is to keep your back straight, as this will help with breathing later on. 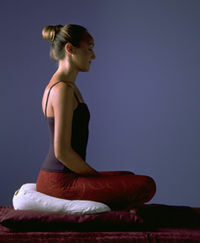 You can also meditate on a chair, but sit on the front half of the seat so that your back doesn't lean against the chair. Any position in which you're relaxed but your back is erect is permissible, even lying down - but be careful that you're not so relaxed that you fall asleep. Breathe deeply and slowly from your abdomen rather than your chest. You should feel your stomach rise and fall while your chest stays relatively still. Relax every muscle in your body. Don't rush this, as it takes time to fully relax. Do it bit by bit, starting at your toes, and working up to your head, until the tension melts away. Focus your attention. You may notice that your mind wanting to wander, find out why to prevent this from happening again. The goal is to allow all of life's negative energy to gradually fade away. Find an "anchor" to settle your mind. Let your attention rest on the flow of your breath. Listen to it, follow it, but make no judgments on it (such as "It sounds a little raspy...maybe I'm getting a cold?"). Visualize a place that calms you. It can be real or imaginary. Imagine you are at the top of a staircase leading to a peaceful place. Count your way down the steps until you are peaceful and relaxed. Silence your mind. Once you've trained your mind to focus on just one thing at a time, the next step is focus on nothing at all, essentially "clearing" your mind. This requires tremendous discipline but is the pinnacle of meditation. Don't expect immediate results. The purpose of meditation is not to turn you into a Zen master overnight. Meditation works best when it is done for its own sake, without becoming attached to results. If you find your mind is wandering, try not to scold or beat up on yourself about it. Wandering restlessly is the normal state of the conditioned mind. This is the first lesson many people learn in meditation and it is a valuable one. Simply, gently, invite your attention back to your breath, remembering that you've just had a small but precious "awakening." Becoming aware of your wandering mind is a success, not a failure. Some people find it's difficult to meditate immediately before bedtime. If you're very sleepy, you may find yourself nodding off. Conversely, meditating may energize your mind, making it more difficult to fall asleep. about their endurance for long meditation sessions--even hours and hours at a sitting. Don't be tempted to change your practice to "keep up." Meditation is not competitive. Avoid bad dreams: if pleading and begging in prayer is your form of meditation, change that to being thankful and blessing others -- in prayer and in life -- to help you progress, sleep, and avoid bad dreams, proven by practitioners.